A WordPress weekend should be covered on a WordPress blog! I spent the past weekend “geeking out” with WordPress. Once again, the online experience led to great real life get-togethers and discussions. I share tips, links, and photos in this post. You should try a WordPress get-together in your neighborhood to get the feeling of energy that I experienced. 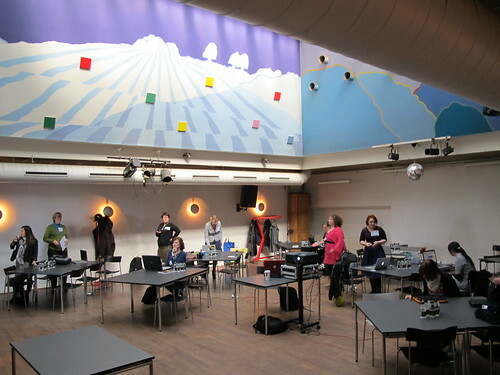 Here’s my report on two days with WordPress – first with the wordpress.dk group and then with the Geek Girls Meetup CPH group. Saturday was a gathering of the usual WordPress suspects from the WordPress.dk community in Copenhagen, thanks to Mark Gazel. First up: Thomas Clausen, who walked us through a list of what he considers to be great and useful plugins. (I drooled because he did his presentation from his iPad.) I confess that I didn’t get all the details about each plugin. Never fear. Follow the links to get the details. I tried to capture the reason why Thomas recommended these plugins. Ozh’ admin drop-down menu – for increased back-end productivity – more “real estate”. Members – good for a WordPress installation that’s a CMS. Go beyond the usual roles available in the backend. Perhaps you want a role called Friends? You can even exclude some content for certain roles. My Snippets – adds widgets to widget areas. Widget logic – Uses conditional tags (if … else statements, such as “if this is a user, don’t show banner”). Comment redirect – can be a nice service for users – after making a comment, the visitor is taken to another page that says, for example, thank you for commenting and do you want to subscribe to my newsletter…. Exec-php – very geeky – executes php code in your widget area. RSS Footer – If I understood Thomas correctly, you can use this code as a sort of theft protection because it is a bit of code that links back to your blog. You can use it on your own blog, but if someone steals your work, the built-in ping or trackback code would notify you about the theft. The details on the plugin site don’t mention this, so I hope someone comments to help clarify this for other readers. Gravity Forms – This is not a free plugin, but could be worth it for some people. It makes all the forms you need for your site as well as surveys and more. Don’t get it if you only need a contact form. It is a powerful plugin. The backend is supposed to be good. For those with needs above and beyond the usual. Learn more from the feature list. Comment reply notification – this is for readers of your blog – sends them emails about follow-up comments on posts where they have a left a comment. Query Posts – a very geek backend tool that is a bad example of usability (for you, the person installing it). Gives you control over the ways you can display pages and posts. I’m not 100% sure about the whys and wherefores of this one. Widgets Reloaded – a better way to handle all your WordPress widgets (according to their blurb). Series – a way to connect a, well, series of related blog posts. This was the most appealing plugin. Think 3-part series on installing something or a 4-part series on an event or a 5-part series on some process. You can place this in your widget logic (if you use that plugin) or not. This is a meetup and the perfect opportunity to work on your blog. You have a group of like-minded people all set to help you if you get stuck. I used my time getting another blog “plugged in”. I had put together a site as a temporary help for a group. 3 years later, I am still the temporary webmaster, so I thought I should add some useful plugins. I tried adding one long on my to-do list: W3 Total Cache. It improves your site performance in a more powerful way than WP Minify. (I think WP Minify is a kind of subset of W3 Total Cache, but I’m not completely sure.) It required more tweaking than I had time for, so now it is installed on 2 sites, but activated on only one. After lunch and lots of networking, Steffen stepped up to the projector to share some code snippets. Steffen collects good code snippets that he finds here and there and saves in Coda. WordPress.dk will post Steffen’s and Thomas’ material as soon as possible. He mentioned some more plugins that caught my attention. Custom Post Type UI – create custom post types and custom taxonomies with this plugin. I’ve long wanted to explore this area, so having a good plugin recommendation may be the tipping point for doing that exploring. Admin Thumbnails – when you are viewing your list of posts, you can see a little thumbnail of its image. I was under the impression that this was best for a blog that was picture heavy. Intrigued. Additional Image Sizes (zui) – The name says it – add more size options for images. Google XML Sitemaps – helps to index your blog and make Google happy. Again, something to explore. WordPress.dk plans a WordCamp later in the year. That will be for 2 days, so there’s more geeking in the pipeline. It’s good fun, so I hope to see a very full house at WordCamp. So many people can use the help that the community is willing to give. The agenda for GGMCPH began with workshops for novices and for advanced. I volunteered to help the novices. That was far trickier than I thought. Almost all of the novices needed help getting their .org software installed on a domain. For those I helped, almost all of the hosting services were very bad at communicating the information needed to prep the wp-config.php file. One had an ftp problem and was getting zero help from the support people. I speculated whether this was why some people gave up. This was a tiny barrier that had a huge impact. They couldn’t get anywhere without connecting the WordPress installation to their database! I will tell Mark that the WordCamp could really use a novice workshop, too. Susie Christensen was good at determining that all needed an overview and she gave that. Then we did mostly one-on-one help. I felt slow and useless, but one person was very appreciative, so I felt better. If the hosting sites had given the right information…. Sigh. Several people asked about finding themes, and we explained how to search for inspiration. @TheWildPony tweeted a question on the same topic: What is your favorite modern theme – and why? I haven’t been theme surfing lately, but one always comes to mind: Stardust. Stardust is a WordPress theme by Tommaso Baldovinno. I think it is a clean theme, but I especially like the fact that the theme is accessible. Your screen readers visitors will thank you. There’s my own blog here, where all images and CSS is tweakable, and it’s accessible. Of course, the author of the blog can mess up the accessibility, but an accessible theme is a great starting point. Those were the ones that I recommended. Finding a theme is really a trial-and-error task. I think it is still hard for novices. Maybe they’ll find a suitable looking theme, but then the backend will be awkward to work with, or they want something slightly different, and cannot tweak it themselves. Frankly, I think we can have another session soon, just on themes! 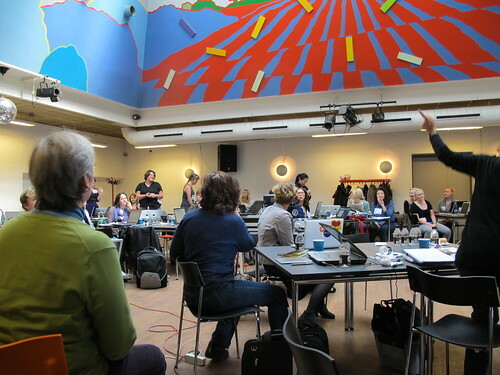 Here’s another picture of the room – now filled with inquiring and listening Geek Girls. My overall note taking was poor. As one of the planners of the day, I was helping with practical things, in addition to helping novices. My multitasking mojo had taken the day off, but I was assured of blog posts and pictures in the coming days. I’ll monitor the ggmcph tag on Flickr for photos, such as one of our lovely carrot cake from our coffee/tea/cake supplier, Kaffeplantagen! When Karen Balle gave 10 tips about design of a blog, I realized we could also have an entire day devoted to design. Oh, there are plenty of unconference opportunities in the air! What do I get in 1 click? Always think as a user. First impression hooks your visitor – you have 5 seconds! What do you want to tell or sell? Explore and invent – invite people to comment, hear what they say, and refine your site again and again, making it a little bit better every time. Keep surprising yourself – hook your readers/buyers. Give a lot and get a lot. This day wouldn’t have been possible without the women who signed up, so thank you to everyone who came. A round of thanks to my partners-in-geekiness: Amelia Berkeley, Annette Pedersen, Henriette Weber, Lisa Risager, and Nanna Thorhauge. To our lovely sponsors – Creuna and Mediabevægelsen and Kulturanstalten – I say hip, hip, hurra! and thank you! To round off this extravaganza of WordPress, I give you – courtesy of @jenniecph – 50 marvelous photos of Basset Hounds running. The brain is overloaded, so a barrel of laughs ends the day nicely! For someone taking no notes you really captured a lot of these two wonderful days! Karen, Many thanks for making a list of the plug-ins we talked about both at the WordPress meetup and the GeekGirls meetup. Another of the plugins that I like to push is the one for http://www.wordy.com – Wordy’s editing services. Though not a free service, it is a lifesaver for those of us blogging in a language that is not our own. Looking forward to the next Geek Girl Meetup!